What do you keep? What do you shred? Are you holding on to papers longer than you need to? Drowning in Paper? You’re not alone. Many of us hang on to paper because we are unsure if we need to keep it or for how long. 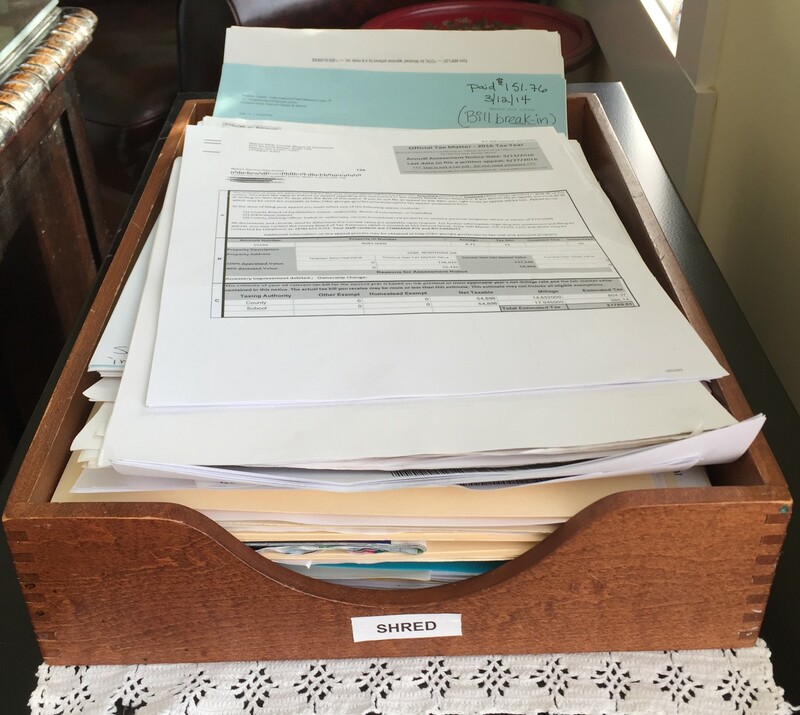 Some common questions I get as a daily money manager and professional organizer include: How long do I need to keep my tax returns, credit card statements, insurance papers? You can find the answers to these and more in the handy guide below which comes from USA.gov. The papers you don’t need to keep but contain personal information need to be shred to prevent identity theft and other potential problems. As our country heads towards a more paperless society, professional shredding has become big business. In Macon we have many options to choose from. Many companies, like Shred-X, Shred Monster and Shred-it, will come to you and shred your papers onsite. Most charge by the pound and have a $75 minimum charge for coming to you. Another option is to bring your boxes to Schnitzer Macon (formerly Macon Iron and Paper Stock). They charge by the pound. Five average size banker’s boxes will run about $30. You can free up a lot of space in your file drawers by letting go of papers you no longer need to keep. And it will make it easier to find the papers that you do need to keep. If you feel nervous about letting certain papers go, take pictures or scan them and put them on a flash drive. Going paperless definitely has its advantages which is a good topic for another issue. For now, follow the list and let go of some paper!